The development of the European Spallation Source is driven by the research needs of the European scientific community. 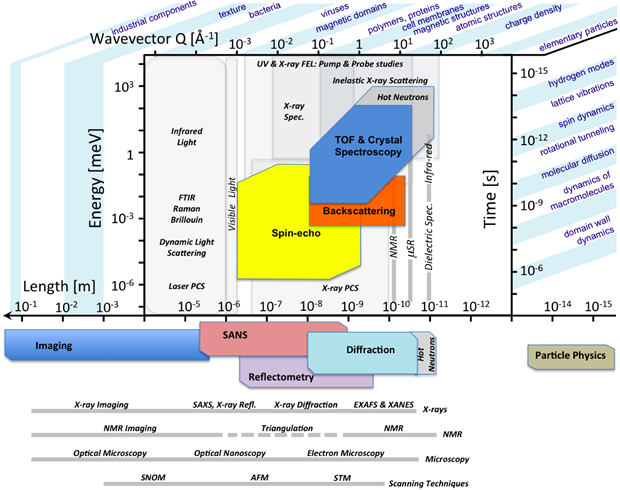 Neutron scattering can be applied to a range of scientific questions, spanning the realms of physics, chemistry, geology, biology and medicine. The European Spallation Source will be a prominent part of the future landscape of global research infrastructures, providing experimental possibilities to researchers from academia as well as Industry. Neutrons serve as a unique probe for revealing the structure and function of matter from the microscopic down to the atomic scale. Using neutrons for research enables us to investigate the world around us as well as to develop new materials and processes to meet the needs of society. Neutrons are frequently used to address the grand challenges, to improve and develop new solutions for health, the environment, clean energy, IT and more. What Do Neutrons Tell Us? Neutron scattering research has evolved into a diverse range of powerful methods capable of extracting very subtle information about the properties and behaviour of many different materials and systems. The special properties of the neutron renders these methods unique in the current landscape of experimental research methods. PROBING STRUCTURE AND MOTION: Neutron scattering enables us to study the structure and dynamics of atoms and molecules over an enormous range of distances and times: from micrometres to one-hundred-thousandth of a micrometre, and from milliseconds to ten-million-millionths of a millisecond (see figure). While other techniques can provide information either within the same spatial range or the same temporal range as neutrons, neutron scattering provides a unique combination of structural and dynamic information. HIGH PENETRATION: Neutrons pass easily through most materials, enabling the study of large or bulk samples and buried interfaces. This also allows for samples to be studied under extreme conditions, such as very high temperature or pressure, of extreme importance in geophysical studies to predict earthquakes, as well as accessing low-temperature states without any deteriorating beam heating. Neutrons are non-destructive, so delicate materials or precious objects can be studied without fear of damage. Neutron imaging can be used to monitor the inside of objects as large and complex as an operating car engine or the pharaonic tomb. A PRECISE TOOL: Neutrons provide an extremely precise tool. Their interactions with matter are not too strong, which makes quantitative analysis and interpretation of the data straightforward. HIGH SENSITIVITY AND SELECTIVITY: Since neutrons are scattered by atomic nuclei, they report on which element and on which isotope is present. This is used to highlight particular groups of atoms in mixtures or complex materials, by selectively substituting one isotope for another in key regions of the molecular structure. This excludes the need for invasive chemical labelling. Neutron sensitivity to protons and selectivity between protons and deuterium forms the basis of selective deuterium substitution, used to study complex biological and other hydrogen-containing materials, for instance the transmittal of drugs across the cell membrane. A UNIQUE PROBE FOR MAGNETISM: The neutron acts as a tiny magnet, but has no charge, so we can use it to study the magnetic structures and dynamics of materials at the atomic scale. This magnetic behaviour is the basis of many important devices, including key components of computers and cars. A PROBE OF FUNDAMENTAL PROPERTIES: Studies of the neutron itself elucidates events from the creation of the fundamental particles and forces during the first fractions of a second after the Big Bang, to the explosions of massive stars, such as supernovae, in which most of the heavier elements were created. ESS will push the frontiers of neutron science. ESS will offer neutron beams of unparalleled brightness for cold neutrons, delivering more neutrons than the world’s most powerful reactor-based neutron sources today, and with higher peak intensity than any other spallation source. 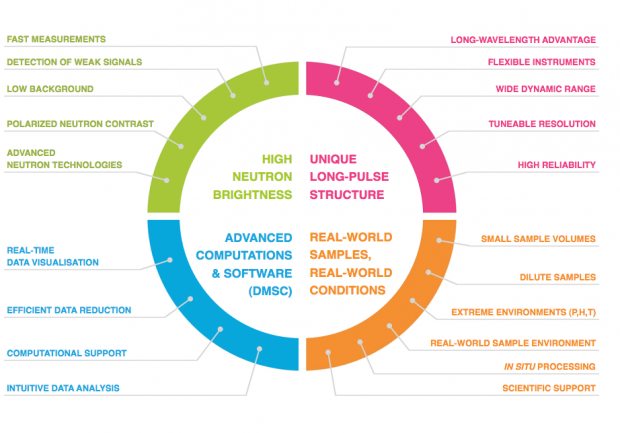 The long neutron pulses (3 ms) of ESS are inherently advantageous to designing flexibility into the instruments. Tailoring the pulse width adjusts resolution and bandwidth, enabling investigations of structures and dynamics over several length- and time-scales. ESS is putting special emphasis on creating and using first-class software for instrument control, data processing, analysis, and visualisation. We strive towards improved understanding of increasingly complex phenomena, representing reality. Complexity can mean a multitude of interrelated physical properties within the materials or studying real-world heterogeneous samples within their (extreme and natural) environment. Combing state-of-the-art sample environment equipment and laboratories with the higher brilliance will allow the study of smaller real-world samples. The increased performance of the ESS facility will elevate research using neutrons to a new level. We will utilise the high beam intensity and long pulses with clever, flexible instrumentation, and enable new science through high-performance computing, real-world sample environments and state-of-the-art support facilities. Smaller and more complex samples will be accessible for neutron investigations, making the study of rare and biological samples and samples under extreme conditions possible, among other things. These gains will bring a paradigm shift in neutron science, and expand the use of neutron methods, providing the wider research community with a smart new set of experimental options. ​​​​​The European Spallation Source is an integral part of the suite of European research infrastructures providing experimental possibilities to researchers from both academia and industry. To maximise the scientific impact of ESS and to ensure a sustained and long-term support of the scientific community ESS has created an organisational structure to generate a vibrant scientific life around key science focus areas. The ESS Science Focus Teams (SFTs) will shape the facility-based scientific activities within each of these science focus areas. The corresponding SFTs provide a scientific home for scientists working in a specific science focus area. ESS scientists, PostDocs and PhD students, but also other scientists and users collaborating with ESS are encouraged to take part in the activities of the SFTs. The SFTs promote continuous scientific exchange and discussion by organising internal topical seminars (every two weeks) and a Science Day (once a year). They also create a scientific support structure for ESS PhD students and Postdocs. From 2011-2015, a number of ESS Science Symposia were held in the European science community. Sponsored by ESS, but organised by representatives of the different communities, these visionary symposia aimed to identify the potential of ESS in each field, and to specify the equipment necessary to fulfil that potential. The reports, available below, have fed the strategic process of establishing the initial scope for ESS instruments and supporting infrastructure. Guidelines on how to apply for funding of a symposium can be found here. ESS also supports other workshops and conferences related to Neutron Science and Instrumentation according to these sponsoring guidelines.